a malignant blood dyscrasia, one of the myeloproliferative disorders, with atypical erythroblasts and myeloblasts in the peripheral blood. acute erythroleukemia a form of acute myelogenous leukemia representing erythroleukemia in which malignant leukocyte precursors have proliferated and become predominant. Simultaneous neoplastic proliferation of erythroblastic and leukoblastic tissues. /eryth·ro·leu·ke·mia/ (ĕ-rith″ro-loo-ke´me-ah) a malignant blood dyscrasia, one of the myeloproliferative disorders, with atypical erythroblasts and myeloblasts in the peripheral blood. a malignant blood disorder characterized by a proliferation of erythropoietic elements in bone marrow, erythroblasts with bizarre lobulated nuclei, and abnormal myeloblasts in peripheral blood. The disease may have an acute or chronic course. Also called Di Guglielmo's disease, Di Guglielmo's syndrome, erythromyeloblastic leukemia. Di Guglielmo syndrome Hematology An acute myelocytic leukemia–FAB classification, M6, which is usually acquired affecting the elderly, but rarely also AD Clinical Anemia, fever, hepatosplenomegaly, hemorrhagic diathesis Lab ↑ Erythroblasts in circulation, BM, ↑ gammaglobulins, false positive positive rheumatoid factor, ANA, Coombs antiglobulin Genetics Aneuploidy–63%; cytogenetic defects, especially chromosomes 5 and 7 Prognosis Poor. See French-American-British classification. a malignant blood dyscrasia of dogs and cats; one of the myeloproliferative disorders, with atypical erythroblasts and myeloblasts in the peripheral blood. MacLeod, "Malignant hematopoietic cell lines: in vitro models for the study of erythroleukemia," Leukemia Research, vol. NF-E2 was purified from mouse erythroleukemia (MEL) cells and is composed of 45 kDa and 18 kDa subunit (14). S5 RNA expression also changes in differentiation and cell death (apoptosis) of murine erythroleukemia cells (Vizirianakis et al. Decursin and PDBu: two PKC activators distinctively acting in the megakaryocytic differentiation of K562 human erythroleukemia cells. In mouse erythroleukemia and fibroblast cells, inhibition of fos and jun has demonstrated their requirement for proliferation and cell-cycle progression (Shanlian and Karin 2001). We have successfully purified ValRS-EF1H complex from K562 human erythroleukemia cells to near homogeneity. Moreover, the retroviral particles generated in this manner can be used to transduce target cells, namely NIH-3T3 and murine erythroleukemia cells (MEL) as shown by PCR. 03 in 17 chromosome 1 [Q09760] AA080628 phosphoribosylformylglycin amidine 7 synthase [P35421] AA080629 ORF 1130 [U20247] 6 AA080630 human thrombospondin 1 precursor 7 [P07996] AA080632 URP5 [1204259B] 16 AA080631 ERCC5 [D16305] 6 AA080635 murine erythroleukemia cardiac calcium 5 channel [U17869] AA080637 ORF gene product [X95373] 7 AA080638 latent transforming growth factor 8 beta-binding protein 3 precursor [A57293] AA080641 aminopeptidase [U35646] 28 AA080643 TO8A11. Based on cytotoxicity evaluation against human cancer and noncancer cells, chelidonine and homochelidonine are more active against blood cancer cell lines (with the exception of erythroleukemia HEL 92. Mavelli, "Differentiation potentiates oxidant injury to mitochondria by hydrogen peroxide in Friend's erythroleukemia cells," FEBS Letters, vol. 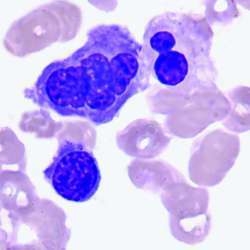 The cell line K562, an NK-sensitive tumoral human erythroleukemia cell line, was used as target cells.